Starfish are also called sea stars, because they are not actually fish. These creatures are best known for their five arms that form a star shape and contain the organs of the body. The outside skin of the starfish is shell-like with a bumpy or spiked surface and small feet that have suction cups to help hold on to prey. Colors of the starfish vary from bright colors like red, blue, purple and orange to light gray, tan, pink or white. Create a lifelike starfish from purchased or homemade clay or sand textured sand clay. Purchase craft clay or use a recipe to make smooth or sandy clay that will dry thoroughly. Consider tinting the clay with dry or liquid paint. Add paint until the desired shade of a color is reached. Roll clay into a circle about 5 to 10 inches in diameter and 3 or 4 inches thick. Keep the thickness of the edges of the circle consistent with the center. Sketch a star shape on the clay circle. Make the five legs rather thick and as long as the circle will allow, or thicker toward the center like a typical star shape, depending on how you want the starfish to look when finished. Place your hand on the clay and cut out the star with a craft or table knife. Work carefully to protect the star legs from being torn off. 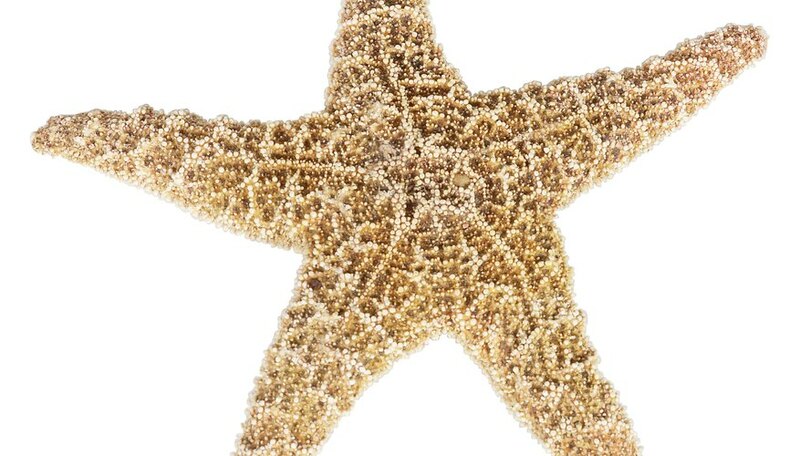 Use your hands to round off the edges of the star and form the star to create the desired look for your starfish. Keep the legs thick and wide, but form something of a point at each edge. Pinch up some of the dough on the top and side surfaces to give the starfish a natural look rather than a smooth one. Create some spikes and turn up one or more pointed ends of the legs, if you want. Turn the clay starfish over carefully. Use the pointed end of a pencil or stylus to create holes that represent the suction cups on the bottom side of the craft. Let the clay starfish dry for several days according to purchased clay instructions or the recommended drying time on a recipe. Paint the finished starfish with a bright or neutral color of craft paint if you want. Sprinkle some colored sand into the paint if you wish to give the craft a more textured look. Consider leaving the craft unpainted and glue some natural or colored sand onto the surface in several places.